Sidmouth Gift's favourite bear, Finley is made using a combination of white, black and grey long-pile plush. His paw pads are grey suedette and he has a stitched grey nose. Please be advised that all of the bears are different and have a different amount of black, white and grey. Finley's ears and muzzle are slightly dappled. 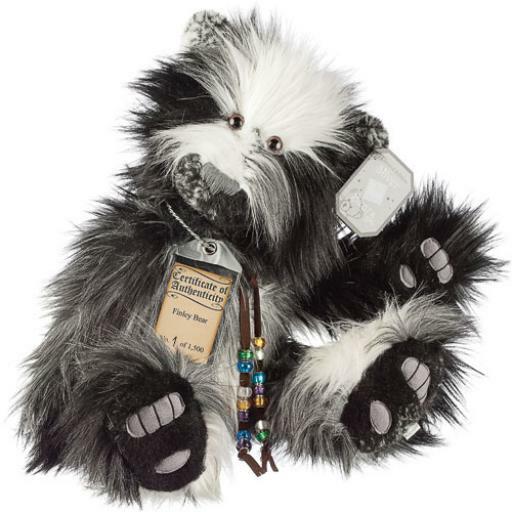 Aswith all the Silver Tag bears, Finley is fully jointed, substantiallyweighted, and has a classic hump. Finley comes with an individually numberedCertificate of Authenticity. He is 45.7 cm standing. Finley is one of 1500. Hecan be spot cleaned.